The Veranda offers you a quiet, restful get-a-way filled with the song of birds, the vision of gardens , the rhythm of rocking chairs - all under the clearest skies in Texas! Our mission is to offer the best of West Texas hospitality to all our guests by providing you with elegant but comfortable accommodations, excellent food, and all the local information you need to make your trip to the Davis Mountains enjoyable. The large front porch (or veranda) faces due south. Patrons frequently spend cool evenings there watching the brilliant display of stars for which the area is famous. Gazers often are treated to the spectacle of falling stars and speeding satellites. The Milky Way is so bright at night that it is regularly mistaken for clouds! 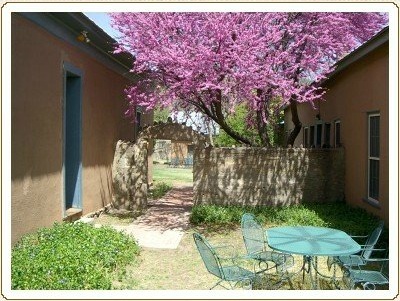 The grounds include two secluded, walled courtyards. One is on the east side of the building and contains two large Honey Locust shade trees, lilac bushes and iris. It has two covered porches, lots of outdoor chairs and tables, and is shaded all afternoon. The west courtyard is smaller and more intimate. Its entry is guarded by a beautiful red bud tree and is spectacular in the early spring. The old, rock-arched entry is constructed of local stone. 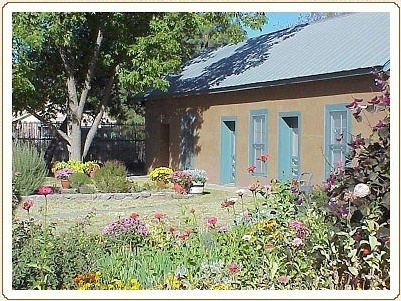 The entire grounds occupy most of a city block and are dotted with gardens and fruit trees. Our guest lounge offers a flat screen television with satellite, comfortable seating and a variety of reading materials. This room is available to guests at any time. A generous buffet breakfast is included with your room! We serve breakfast every morning between 8 and 9:30 am (earlier breakfast available on request). The Veranda serves the highest quality organic fair trade coffee which is locally roasted by Big Bend Roasters to our specifications. Our buffet consists of boiled eggs, a variety of cheeses, yogurt, muffins, coffee cake, house made granola, toast, fruit and juice. All of our baked goods are made in house from scratch. Fresh fruit is always included with breakfast. If your timing is right, we serve fresh fruit from our orchard or locally grown Fort Davis apples. With advance notice we can accommodate vegetarian and gluten-free diets. We do offer evening meals for groups (family reunions, retreats, etc.) with advance notice and for an additional charge.